I’ve been using an ad blocker for the last two years. Ads were increasingly slowing down my browsing experience, to the point where I had enough. This was around the same time I started using Pocket, the other nail in the ad coffin. Apart from user experience people people often claim to install ad blockers due to privacy concerns. I don’t buy that. Privacy is considered important, until we can trade it for something better. And for most of us “better” comes along quickly. We are willing to part with privacy for as little as shining on a virtual stage with endless streams of photos broadcasting our fantastic lifestyle, our exotic holidays and our adorable babies. Since its inception ad creators have been pushing the envelop for ever more attention-grabbing “creatives”. In a world where ads are competing ever more fiercely with each other for our attention, the ad model became a race to the bottom. And that bottom has been reached: ad blockers are becoming mainstream. For me personally: if ads would load in way that doesn’t affect the consumption of the content I’m viewing I probably never would’ve installed an ad blocker. But ad publishers are greedy and short-sighted: they focus their innovation on stealing attention. Instead, they should’ve focused on not punching the consumer in the brain. So yes, I believe this is fair. The web is probably the truest democracy we have, and the people are claiming back what’s theirs: their focus. ROAS will go down. Smaller content creators will kick the bucket, reducing diversity. More money will move into native ads, eroding brand trust even more. In the longer term it will be a different story. When revenue generated by free ad-supported content dries up, paying for content becomes the norm. And payment can come in many different forms. Many websites started offering weekly subscriptions. Others are asking for a share on social media or a newsletter opt-in. 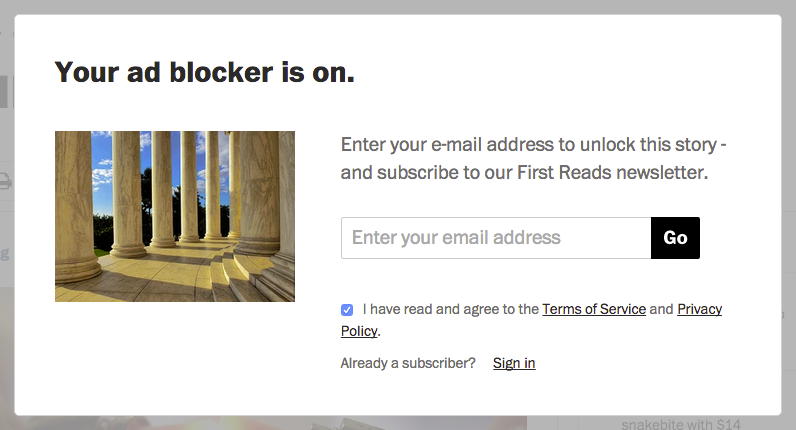 The Washington Post asks for a newsletter opt-in in exchange for access with an ad blocker on. Is this a bad thing? Not necessarily. Content quantity will go down, but average content quality will go up. When the dirty incentives for generating and optimizing content for clicks are removed only purity remains. We might be on the brink of our most productive time yet. But we’re not exactly there yet. Success stories of paid access to content are thinly spread. I don’t think this is because people don’t want to pay for content. Just look at Spotify and Netflix. Both are doing what was believed to be impossible due to the incredible proliferation of online piracy. So why are people paying instead of pirating their music and movies? Because paying is the most frictionless thing to do! Our current systems of payment are highly fractured. Every publisher has its own paywall implementation, having nothing in common except for the fact that they are cumbersome, inefficient and usually poorly timed. When you give me a paragraph of four lines and then ask me to wrestle through a twelve-field form to see the rest, you’re doing it wrong. It’s a lob-sided exchange: you know the value of my registration but I don’t know the value of your content (yet). You have to give me time to decide whether your content deserves my payment. And when I do decide to pay, it should be a breeze to do so. What the world needs is a smart payment platform for access to content. A platform that allows me, as a consumer, to taste content and pay at the right time with minimum effort. A platform that at the same time is virtually effortless for publishers to implement. Make it frictionless for both sides and it will work. It’s 2015. We have virtual currencies and according to Jeffrey Hammerbacher all the smart people are working in this industry. This can be done.